(CNS): Justice Alex Henderson has ruled against the four West Bay women who challenged the closure of the West Bay Road, stating that their action was out of time. The judge didn’t make any significant rulings on the arguments in the case because, having decided that the clock was against the women, he didn’t have to consider the grounds of the challenge. However, the judge made a significant finding when he agreed that the ladies had a right to bring the case under the constitution and not as a judicial review, which will set precedent for future legal challenges to government decisions. The women are now considering an appeal on the time bar so that the actual arguments against the road closure may be considered. In his 23 page judgment, Justice Henderson said the action, which was brought by Alice Mae Coe, Betty Ebanks, Annie Multon and Ezmie Smith and heard in December, was too late to be considered on its merits. Justice Henderson disagreed with the ladies' argument that the clock only began on the action when the road was actually closed and not when the decision to close it was made. While he agreed with the lead attorney representing the West Bay women, Anthony Akiwumi, that the issue was a continuous process, he disagreed with him that the actual decision was only made when the road was gazetted. The judge said the decision was taken at the point of the NRA agreement, which was signed between the government, its roads agency and the Dart Group in December 2011. He said the plaintiffs knew about this agreement and he said that, given the widespread publicity about the road closure, the gazette amounted to nothing more than compliance with a legal formality. He said the plaintiffs had always been well informed about the road closure and there was nothing before him that justified the 14 months delay in bringing the action. However, the ladies still question this point and in a short statement released via their lawyer, Irwin Banks, they pointed out that the agreement made on 15 December was not made available to the public and was not at that point a “done deal” and was subsequently subject to various amendments, including the actual length of road that would be closed should the deal progress to that point. In addition, the agreement was then subject to an independent review and, as a result, the agreement and road closure was by no means certain at the point it was signed in December 2011. Despite the set-back, the women are not giving up on the battle to re-open the West Bay Road and said they will be considering the judgment closely with consideration to an appeal. This was the second legal action filed challenging the legality of the road closure. Rupert Ackermon filed his action as a judicial review last year, which was also found to be out of time by Justice Charles Quin. So despite the legal action taken so far, no judge has actually considered the merits of the legal challenges being made to the actual closure of the West Bay Road to facilitate the beach front resort being developed by Dart on the former site of the Courtyard Marriott. See Justice Henderson’s decision in the case below. The City Commission of Weston, Florida is presently reviewing that city's 2022 Business Plan. That is foresight and normal in forward-looking socities. In the Cayman Islands, our version of "forward-looking" is, on average, months to a year, maximum. There is no way that civic planning, or any type of plannng for that matter, can be effective with the short-sighted, near-term approach taken in Cayman. Not since Sir John Cumber's development vision for the Cayman Islands, as embodied in the 1972 Development Plan, have our islands had any effective near-to-long-term development plan. We know that Plan was thrown out by the 1976 – 84 Government. Clearly politics have been the primary impedance of forward thinking in Cayman ever since. Vision 2008?? Anyone recall that venture? What a larf!! This decision seems to set a bad precendent that a government need only delay gazetting any backroom deals for a year and the public would be barred from bringing a court challenge. That is troubling in the extreme. Bring this forward to another major project. It has been widely discussed that government is considering building a cruise ship dock. As such everyone is on notice under Justice Henderson's reasoning. Would it then be acceptable for a neighbor to the project to find out the exact location of the dock the day the heavy equipment arrives to break ground? Gazetting serves an important role. It is the final, definitive, no-excuses notification to all interested parties of government action, whether a change of law or a development decision such as this project. Judicial approval of any other sort of notification brings forth a plethora of potential challenges to all manner of government action that the gazetting process is designed to prevent. I would have much preferred that the case be heard and decided on its merits, even if the decision would be to uphold the road closure. We the Plaintinffs would like to officially register our concerns regarding the aforementioned matter. We are upset over this action however, we cannot be definite in our complaint at this time. All we know is that we heard that a section of the West Bay Road is being closed – and we don't likethat! Anyway, we hope you can use your common sense and "see where we coming from" with this. Please do something, please Mr. Justice, Sir. Thank you for time and attention to this matter. * The judgement suggests that the plaintiffs' filing and case should have resembled something like the above. Now we have time limits on what is right and what is wrong? For most crimes there is no statute of limitations. This wasn't a criminal complaint, it was a civil complaints. No crime was alleged. Incorrect most crimes do have a statute of limitations except for murder. The question must go back to the 4 ladies, why they didn't bring their legal issue prior to the construction and road closure ? Incorrect. There are no limitation provisions for crimes. You have been watching to much US TV. But this was not a criminal issue. It is a public law issue, and public law has always had short periods to bring challenges for sound reasons. Not sure how there can be thumbs down for what appears to be a statement of fact. There was no case to answer as nothing has changed from Great Grandfathers time except to stop cars from using it. The road was done that way because it was all we could afford at the time. Everyone in Grand Cayman can still travel through the road like before. We never had cars before. It was a waste of money to go to court. It is safe to go to the beach now. All i want to know is how much did these women cost us the Cayman islands, and why were they awarded legal aid? now they should be hels responsible to repay back these funds. Completely a waste of the courts and public funds!!!!! Oh, forgot, they will now appeal wth our funds!!!! The other question is, why did they no complain when hotels and condos on cown land were being biult so we could have views of the ocean and beachs to play on? How does one case that was never heard generate a 55 page opinion while another 3 day case with multiple arguments generates a measly 23 page ruling? Very bizarre. That guy on the Rooster at 8:05 AM this morning had it spot on. Said all that needed to be said. Did he say that it was a hopeless waste of public funds and anyone who thinks a road has cultural value is crazy? A surprising but welcome editorial shift on Rooster. Seeing has how I don't listen to Rooster at all, let alone at 8:05 this morning, your post is useless to me. You know the problem with your post? First, I don't have a time machine to go back to 8.05am this morning and listen to Rooster. Second, if I had a time machine Idefinitely would use it to do better things than go back in time to listen to Rooster. If nobody likes the new road, can you tell me why it is completely full of cars every weekday morning now and causing traffic jams right from Camana bay all the way up to Cost U less on occasions? Was not like that 6 months ago..what used to be a 3 minute jounrey to work for me now takes 12 mins on average. Or maybe its just the people who moan about everything beforehand and then realise its was not such a bad thing after all. If people were really angry, they would not use it. It seems people have voted with four wheels. The road is here to sat…moving on now to more important things..
Did anyone say they didn't like the new road? Poster on Friday at 12.39 seems to misunderstand. We have to drive the new road whether we like it or not now that the old road is closed! This is about the road closure and that posters report of traffic jams only strengthens the argument that both roads are needed. All the lazy thumbs downers were sleeping and missed it. Who listens to that populist bandwagonesque diatribe? It's a pity people didn't take a few of the other crazy decisions to court. The WB road closure is pretty small beer compared to some of the previous deals done by CIG behind closed doors. The re-leasing of Crown land in 2007-8. The gradual erosion of height restrictions on new buildings. The complete failure to apply any set back requirements, allowing new properties to be built literally on the beach. 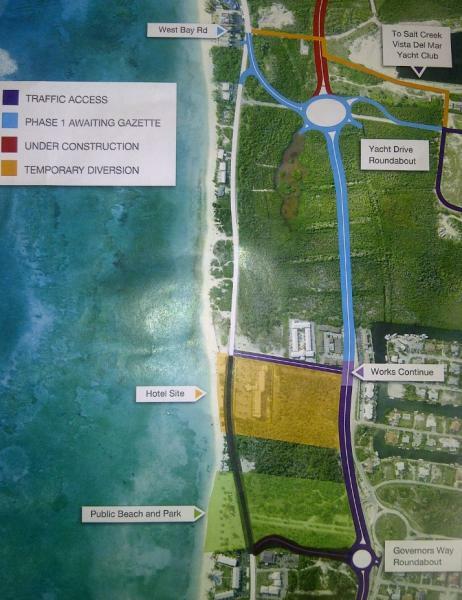 The unrestricted excavation of waterways to new developments, opening up large areas of Grand Cayman to the propect of catastrophic flooding if (when?) there's a repeat of Ivan. Bottom line is there's no coherent planning/conservation policy anyway so who gives a damn about a few hundred yards of road? I trust these ladies will now be paying everyone else's legal costs (including the government QC that we all effectively paid for) for this total waste of time and money? I agree with the ladies – go ahead and appeal the case. This deal was done behind closed doors and it is the public's road and no poltician should have the right to do what was done. We're tired of being sold out to the highest bidder!!! I think Henderson is all about the law. He is strict. Forget the emotional rhetoric and people's feelings. Being about the law is probably what we call a "good thing" when the person in question is a judge. Keeping spinning this whatever you want CNS but this deal is done and everyone is enjoying the road. Looking forward to the completion of this project! How about protesting the dump ladies or is that too far out of your jurisdiction to care???? How about I steal your car and enjoy it? Thanks so much. You believe the road was stolen? The sitting government of Caymanians made this deal with Dart and both sides lived up to the deal. Everyone knows were the West Bay Road to be reopened Dart would sue the government rightly for breach of contract for at least the cost of the road work. Thank you ladies for doing what the rest of us still don't do enough of….that is,,,stand up for Caymanian rights. l support you all in an appeal. (No doubt if you all had of tried to file the case in" or "on time" you would most likely have been told you had to wait until you knew what you were object to or …blah, blah, blah.) Take one page from Uncle De De book, when you want it, push forward. This is such a joke!! Come on ladies, give it up! Presumably the four deviants have been ordered to pay costs? You know who should pay – the 5 Cabinet Ministers at the time who agreed to the deal and signed away our heritage. Stupid, stupid decision. Signed away your asphalt "heritage". That about sums it up. If a little bit of tarmac is your heritage, you didn't have any heritage in the first place. "Our heritage"? A crap road? That's what you think of when you think of our heritage? It is about as good as it gets. thank god…….. in dart we trust……. How could any other ruling be expected? The road is done and the money has been spent. a victory for common sense…..
Obviously, I am no judge but – what the heck did I just read?! I have to vehemently disagree with the basis of this ruling. How can the signing date of the FCIA "agreement" be the starting point in the closure of the road? There were so many uncertainties surrounding that "deal" – even to the point where BOTH sides admitted or declared that terms were subject to changes and amendments. Furthermore, as the lawyer pointed out, many / most of the details of the "deal" were kept mysteriously confidential from the general public. Dare I say the mystery has been solved?! At the very least Coe et al should appeal this ruling. If not just for the concerns surrounding this particular case, but for the very future of the appearance of justice in the Cayman Islands. The road closure was agreed, the ammendments were fine tuning the terms, none were deal breakers. Think of it like this, if you are building a house doe the project start when you break ground, when you design it, or when you go to planning? And when you are building the house if you decide to change the internal layout does that mean you start from scratch, or ammend the drawings? Get a grip, let it go, and stop wasting money! Thank God, Whodatis, that you are not a judge. The ruling was passed according to the law of these lands and you wish to challenge it. The law is there to be upheld and it was upheld, albeit on a technical point. So now move on. Lesson learned, get your legal challenges in on time or not at all. Why wait until the road was built? Why not earlier? You are the kind who would retroactively change everything and no one could get anything done here. Or maybe you had a bad day and changed a law so you can prosecute the person who pissed you off. That is not real law, Whodatis, that is dictatorship. Then take the people that you elected to court if you think they did wrong, or had something to hide, or benefited personally..or is it easier just to blame dart, as he is a goddamn "paper" caymanian anyway, not the real Mcoy.. The problem with that line of argument is para 7 of the ruling, where the judge points out that none of the parties to the claim, including the 4 ladies, suggested that any of the subsequent amendments post 15 December 2011 were relevant. The issues that the ladies were complaining about were patently clear from the outset. They just did not file within the timeallowed by the Constitution that they are attempting to rely on. That's not the Court's fault, I am afraid. I didn't realize we had so many Appeals Court Judges in our midsts. I thank each and every one of you for your learned opinions on the matter at hand! I read the judgment and see nothing that suggests a precedent for future legal challenges. I hope the ladies don't waste any more legal aid going to appeal. Not only do you not "see nothing" but also FAIL to comprehend anything in the judgement. Where do you get the idea that the ladies needed "legal aid". Perhaps you can have some of that "legal aid" with the KOOL AID you are drinking. The time bar was obvious which is why this should never have gone to trial. But who signed off I legal aid on such a hopeless claim? Although I do t agree with the ladies, they put up a good fight. Time to move on, and let Dart complete the remainder of the beach park and bike and walking trails. Rest easy, it will be alright. Lets all reserve judgment until after the beach will be done. I'm sure Dart will make it extra beatiful after all this. It will be just as beautiful as the the Bodden Town park. I hope the restrooms are not an example of what Dart is famous for. A real disaster. Poor maintenance and constant problems. Dart is not responsible for the maintenance of the parks; the CI Gov is. Dart did it initially, and actually did it for a year longer than they originally agreed to do, but then handed over to the Parks & Cemetaries Unit. That's when the disaster started. It is a travesty that we can't even keep our parks clean. Even at the Dart Park in South Sound, I found trash all over the ground that had obviously been there a couple of weeks. Can we not do anything right for God's sake? You found trash all over the ground at Dart Park in South Sound that all the Dart supporters frequent? Now that really does say it all doesn't it. We have so few people with any civic pride. Why does anyone have to collect OUR trash from the ground? ?